How To Engineer Your Layoff enables you to live a more meaningful life as it teaches you how to profitably quit your job with money in your pocket! How To Engineer Your Layoff eBOOK *What if you could take a six month break and travel the world for free? *Wouldn't it be wonderful to spend more time watching your kids grow up? *Wouldn't it be great to connect more with your aging parents? *How awesome would it be if your employer provided free startup capital to launch the business of your dreams? *Imagine never having to set an alarm clock on Sunday night because Mondays are just like Saturdays! *Imagine not looking back on your life filled with regret about the things you didn't do. *Imagine being happy and stress-free once again. How To Engineer Your Layoff enables you to live a more meaningful life as it teaches you how to profitably quit your job with money in your pocket! As a manager at a large corporation for the last five years, I share with you my insights on how to better negotiate your severance. Every year that goes by is one less year you have to live. Don't waste it on doing things that provide little meaning. You will be empowered with important employment knowledge that shockingly few employees understand. You'll learn how to build the right relationships at your firm to negotiate the best severance package possible. The book will also help squash any guilt you have for leaving your colleagues, managers, and friends behind in this economy. How To Engineer Your Layoff will empower you to change your life for the better! Success stories keep rolling in. In October 2012, after five years of working at her stressful corporate job in finance, Nancy was able to negotiate three months of severance plus six months of health care to reclaim her health and spend time with her family. After three years of working at a consumer product company, Jason was able to also negotiate three months of severance plus one year of COBRA to go travel the world this coming winter! Finally, one client even walked away with a severance package of well over $100,000 and is now working for another competitor effectively earning double the income! My book goes into detail of five people who successfully engineered their layoffs. Time and dedication. My new book is a step-by-step guide gives you the framework and the guts to navigate the sensitive process of severance negotiation to find new meaning in your life. The book has taken me two years to write due to the immense amount of time researching the process, testing the framework, advising multiple candidates, and implementing my own layoff. I have interviewed dozens of candidates who have successfully negotiated or received a nice severance package and implementing all the crucial nuggets of information in my book. Way too many people put in their two weeks notice and quit, leaving potentially thousands of dollars on the table to the employer's delight. Thanks to the framework laid out in my book, I managed to negotiate six years of current living expenses. An important point of negotiation was not losing three years of deferred compensation. It's important to focus on the number of months or years your separation package covers because everybody's living costs and savings habits are different. Put it another way, my separation package saved six years of my working life! Every severance package will be different depending on one's negotiating skills, existing income, and duration of employment. However, any severance package is better than no severance package just like any layoff is better than any firing or quitting due to unemployment benefits. My book will prepare you for one of the most stressful, yet potentially most exciting times of your life! The book can now be yours for the introductory price of $48 for the year 2013 compared to the retail price of $88. What's greater? $1,000 in benefits or $48? How about $20,000 in annual unemployment benefits or $48? What about thousands of dollars in severance or $48? What is the price of freedom? The choice is clear. Who Is Sam Dogen And Why Should You Listen? * Sam Dogen worked in finance for 13 years, received his MBA from UC Berkeley, started the largest personal finance network on the web (Yakezie Network), and has his own popular personal finance blog, Financial Samurai, where he slices through money's mysteries. 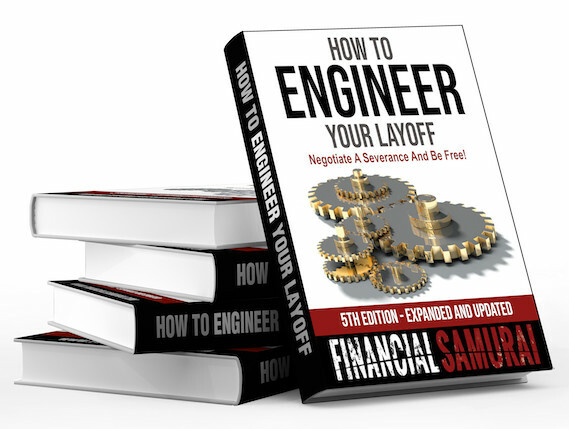 Want to learn even more about How To Engineer Your Layoff? Visit my primary store page. Thanks For Your Purchase! Engineering your layoff takes time and planning. There is no magic bullet. If you do not plan to read the book thoroughly, and utilize the framework over a 3-6 month period minimum, this book is not for you. On the other hand, if you are serious about your future and implementing my advice, then you have absolutely come to the right place. If you are planning to quit your job anyway, I'm confident that my book can only help you provide the best transition possible. Success takes action. Once you are armed with knowledge, everything becomes that much easier.